Please note that the content of this book primarily consists of articles available from Wikipedia or other free sources online. Harold Armstead Covington (born 14 September 1953 in Burlington, North Carolina) is an American white supremacist political activist and novelist. 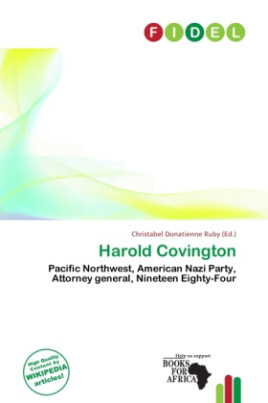 He advocates the creation of an "Aryan homeland" in the Pacific Northwest region of the United States.In 1980, while leader of the American Nazi Party, Covington lost a primary election for the Republican nomination for candidates for attorney general of North Carolina.